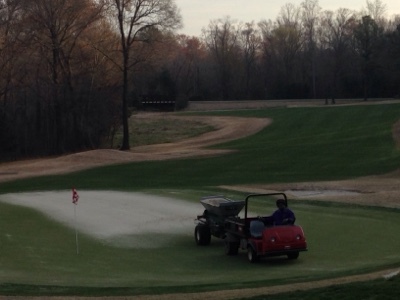 Spring is the time for us to aerate greens to promote water infiltration and help aide root growth and overall plant health. 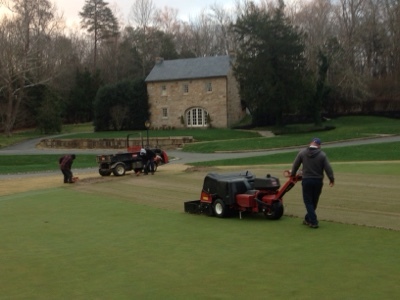 Here we are aerating greens using 1/2 inside diameter times to remove small plugs every 2.5 inches. The plugs are collected and taken away from the greens complexes. This picture illustrates piles of plugs at the end of each pass the aerator takes. These plugs are being loaded into the vehicle for disposal. 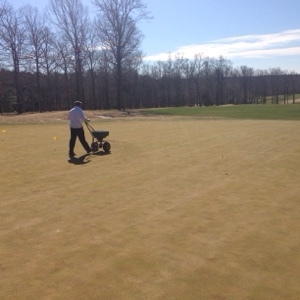 Here is #2 green after topdressing has been applied. 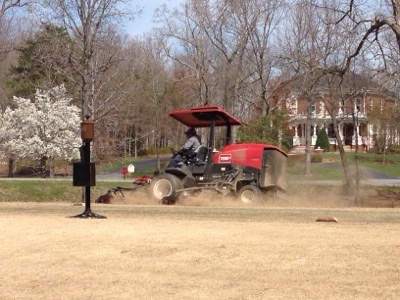 Brushing and blowing will help to fill the holes left by the aerator. 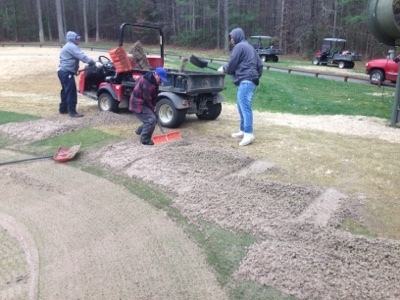 On Wednesday we apply a second application of sand to fill any remaining holes. 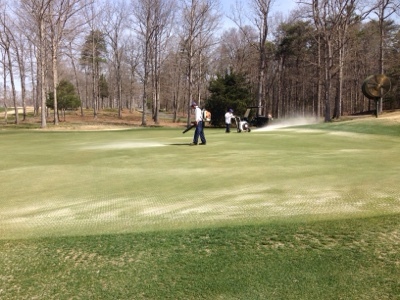 This sand is brushed and blown into holes as well. 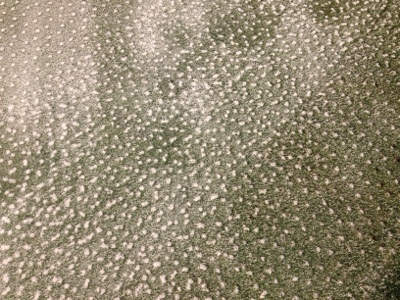 Here is a view after the holes have been filled in completely. Here Martin is scalping down the Bermuda grass to help the sunlight warm the soil and to also get more light to the crown of the plant for better green up. 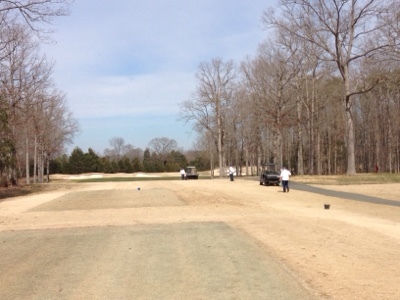 Each year we collect several hundred samples throughout the course. Each sample bag has a collection of soil with-in a 30 ft diameter circle. Each sample bag will be marked with GPS coordinates. This will be down-loaded to a speaclized spreader that will apply the needed nutrients to each area that has a defecitency. We will have a total of approximately 350 samples to send to the testing lab. 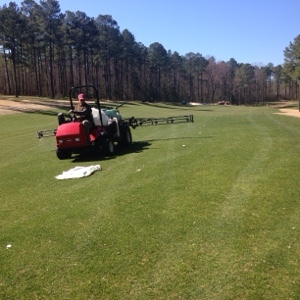 Results will be back in a couple weeks and fertilizer will be applied during April. 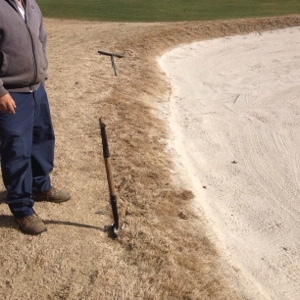 The staff is edging out the bunkers that have grew in over time. 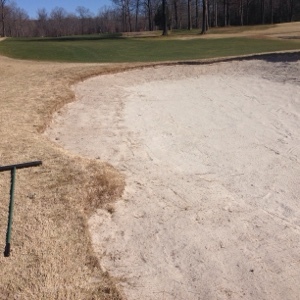 Each year we find the worst bunkers to renovate back to the original edge. 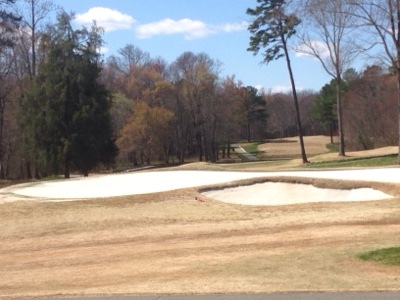 This is the green side bunker on #2. This is one of the worst ones we have seen. 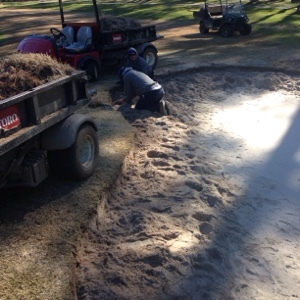 Staff working on #6 fairway bunker.